Model #: APC3012NC Click to view the whole line. This 12 volt to 120 Volt pure sine wave inverter charger 3000 watts is a combination of power inverter, battery charger and AC auto-transfer switch with a peak DC to AC conversion efficiency of 88%. This Sigineer Power inverter charger 3000 watts changes 12 Volt to 110V 120Vac Pure Sine Wave output. It is an inverter that converts 12V DC (direct current) power into 120V AC (alternating current) electricity to power tools and appliances. A built-in 30 amp transfer switch will automatically switch between shore power and battery-bank power within 10 mili seconds. A 100 amp multi stage AC-to-DC battery converter charger uses AC power from the grid or from a generator to recharge a battery bank. The battery-type selector on the top of the 3000 watt inverter charger allows the ability to adjust the charging voltage to the battery bank. 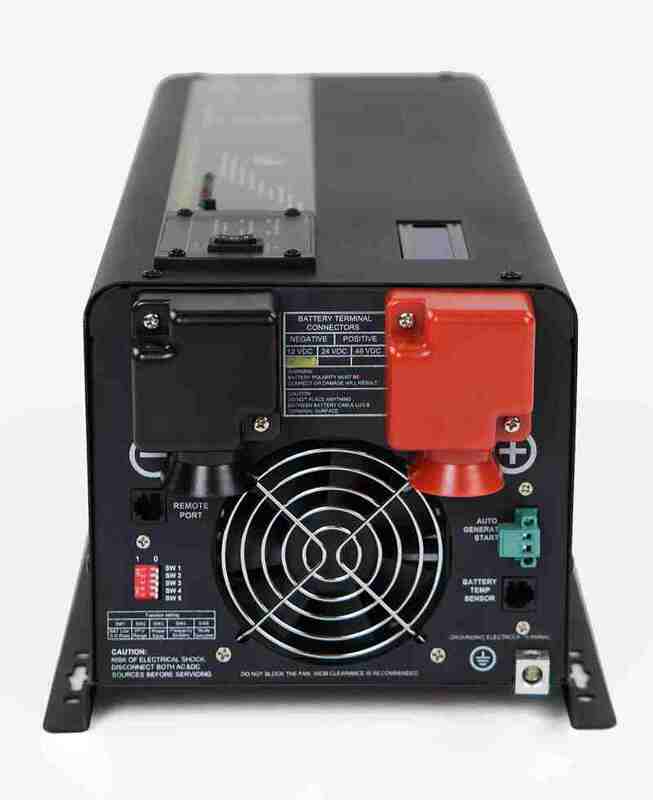 This 3000 watts inverter charger is of industrial-grade, capable of withstanding surges of 9000 watts for 20 seconds, and its direct connect terminal block allows you to harness the full 9KW. It works at nominal 12Volt battery bank, it has different battery shut down voltages, namely 10V and 10.5V, thus allowing different DOD(depth of discharge). It is built with high efficiency components with an idle consumption of 11 watts in power saver mode, it is great for running your whole house, business office ,large RV, renewable solar, off-grid, mobile and emergency backup power applications that uses 110 or 120 volts AC. This product also has a frequency switch that allows users to operate at either 50 or 60 hertz. It boasts a maximum of 10 millisecond transfer time with a 30A transfer switch. 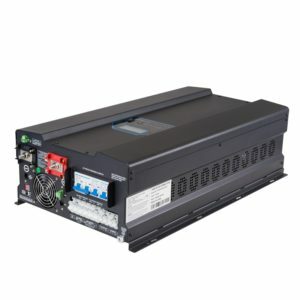 This feature is great for backup power applications, as the inverter virtually works as uninterrupted power supply (UPS). The featured battery-type selector helps user regulate the charging voltage according to different batteries. This capability will maximize battery lifespan. This inverter can power up any loads within its wattage, it can easily power tools on a work truck, such as electric chainsaws, portable grinders, shop vacs, and more. It serves as an automotive inverter for RVs, over-the road trucking, conversion vans and fleet service vehicles without the annoying noise or pollution from a generator. We also have larger comparable units that can handle higher startup surges of tools with larger electrical requirements, such as an air compressor. The inverter is marine-graded and is resistant to dust and/or water vapor in the air. This feature is great for boating applications. The inverter charger 3000 watts comes with Auto Generator Start that starts up a generator and provides charge to the batteries or provides power to your home. This 3KW inverter charger supports a remote diagnostics LCD screen displaying abnormalities on the system, giving you clear directions to track the issue and troubleshoot.